GENDER STEREOTYPING STARTS IN PRIMARY SCHOOL AND CHILDREN’S CAREER ASPIRATIONS DO NOT MATCH WORKFORCE NEEDS. 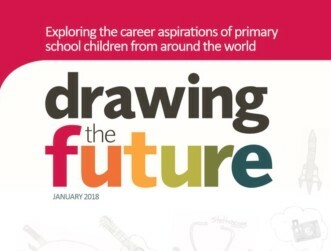 Drawings from over 20,000 primary school children show that skills mismatch starts early and career aspirations change only marginally after the age of seven. 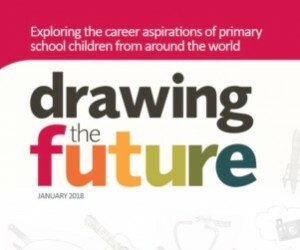 Education and Employers, a UK-based charity, today launched a landmark report, Drawing the Future, which revealed that the difference between children’s career aspirations from age seven to 17 are marginal, and too often based on gender stereotypes and socio-economic backgrounds, and influenced by TV, film and radio. The report also shows that some sectors vital for economic health look set to be badly under-resourced in the future. Are the dreams, hopes and aspirations of children important? Do they shape who and what a child can become? Drawing the Futureis the first global research to ask children from 7 - 11 directly what they want to become - by drawing their ideal future job - and what influenced them in their answer. To determine the factors influencing career choices, the survey also asked participants whether they personally knew anyone who did the job, and if not, how they knew about the job, as well as their favourite subject. Over 20,000 entries were received from the UK as well as Australia, Belarus, Bangladesh, China, Columbia, Indonesia, Pakistan, Romania, Russia, Switzerland, Uganda and Zambia. The report, which will be presented to economic and business leaders from around the world in Davos on 25 January, responds to recent findings by the World Economic Forum that the global gender gap widened in 2017. Drawing the Future shows that even before we enter the workforce, gender stereotypes have been formed. In terms of gender stereotyping and gendered career expectations, aspirations tend to lay in stereotypical masculine/feminine roles across the sample. One of the most popular jobs for boys is often police and armed forces while teaching emerges as one of the most popular professions for girls. The trends for STEM related aspirations is largely similar. In keeping with popular theories around masculine and feminine roles, boys showed preference for working with things, e.g., as an Engineer or Scientist whereas girls aspire to jobs working with people / caring professions e.g., working as a teacher, nurse, doctor or vet. In all countries, Maths or Science is in the top two favourite subjects among children (for girls and boys), apart from children in Australia and China. The general trends suggest that in some developing countries children have more practical and high professional ambitions (Doctor, Teacher), whereas in developed countries they are often formed around celebrity culture (e.g. Sportsperson, a career in social media and gaming). Parents, and other members of extended family, are often the biggest influencer if the respondent indicated that they knew someone personally who did that job. The exception is in developing countries such as Uganda and Zambia, where teacher is often the biggest influence. If a young person did not know someone personally who did that job, TV/Film is the biggest influencer, again with exception of Uganda or Zambia. In all countries, less than 1% of children state they had heard about the job from a volunteer from the world of work coming in to school. The survey also revealed that children’s career aspirations have little in common with projected workforce needs – proving that despite government interventions, we are failing to attract young people into careers in future growth sectors and those where there are already significant skills gaps. The report was carried out in partnership with OECD Education and Skills, Times Education Supplement, the NAHT and UCL Institute of Education.